For easy lash extensions: Apply 10-15 individual lash clusters per eye. To use as accents: Apply 3-5 individual lash clusters on the outer corners only. To fill gaps: Apply only where needed. 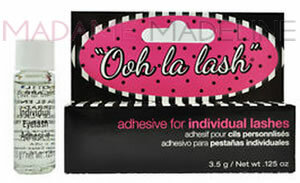 Pour 2-3 drops of Ooh La Lash Individual Lash Adhesive onto a small piece of foil. Keep bottle tightly capped to prevent spilling and to keep the adhesive from drying out. Remove individual lashes from the tray by gently grasping it with tweezers near the knotted end. Dip knotted end of the lash cluster into adhesive. Do not fully coat the lash with adhesive. More adhesive does not mean better adhesion. Starting at the outer corner of your eye, place a lash cluster on top of your natural lash with knotted end as close to your eyelid as possible without touching it. Gradually apply lash clusters, working towards the inner corner of your eye. Please Note: LashTite Adhesive will not stick to natural lashes that have been cleaned with an oil based make-up remover. As with all lash adhesives, make sure to avoid using make-up removers and face wash containing oil (oil based). Product Care Tip: Make sure to keep your LashTite adhesive AWAY from heat and direct sun light, and keep the cap on tight during storage.